America's political circus will soon roll through Cleveland and then Philadelphia--the sites of the Republican and Democratic National Conventions. And, not without some merit, there's concern that the carnivals could turn violent, as happened in 1968, when Chicago's mayor Richard Daley, backed by 23,000 police and National Guardsmen, assaulted protesters in the streets. A federal report later called it a display of "unrestrained and indiscriminate police violence." 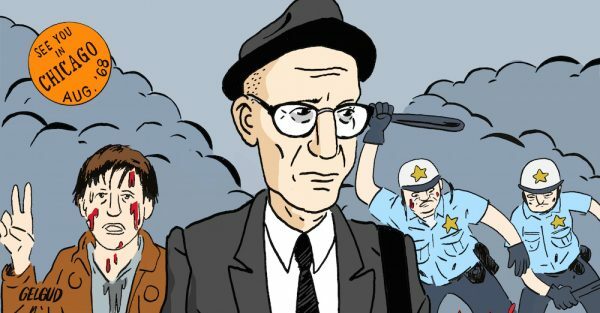 This week, that tumultuous '68 convention is being commemorated in a comic over at The Paris Review. Issued in daily installments by illustrator Nathan Gelgud, the comic--simply titled "Unconventional"--looks at the writers, artists, and demonstrators who attended the convention. Part 1 features poet, singer, activist Ed Sanders. Part 2 puts Jean Genet center stage (who knew he was there?). Part 3 focuses on Norman Mailer, who was always ready for a fight. Part 4 gives us the inimitable William S. Burroughs, and Part 5, Terry Southern. You can follow the series here. To learn more about what happened at that historic convention, you can read Battleground Chicago: The Police and the 1968 Democratic National Convention.